The world of photojournalism has never really stood still. Even when it was film based the technology that allowed pictures to be transmitted & disseminated was always changing. I remember when I first started out in the late 1990s. Then, living in London was a huge advantage. Most of my work at the time was travel photography. Newspapers used to ring me up and ask me about a list of pictures or fax me over an article (yes, fax. Remember them?) to illustrate. If I had suitable pictures to send they’d get a motorcycle courier to collect them – and pay me a £25 search and service fee for submitting them whether they were used or not. How the internet age has changed all that! 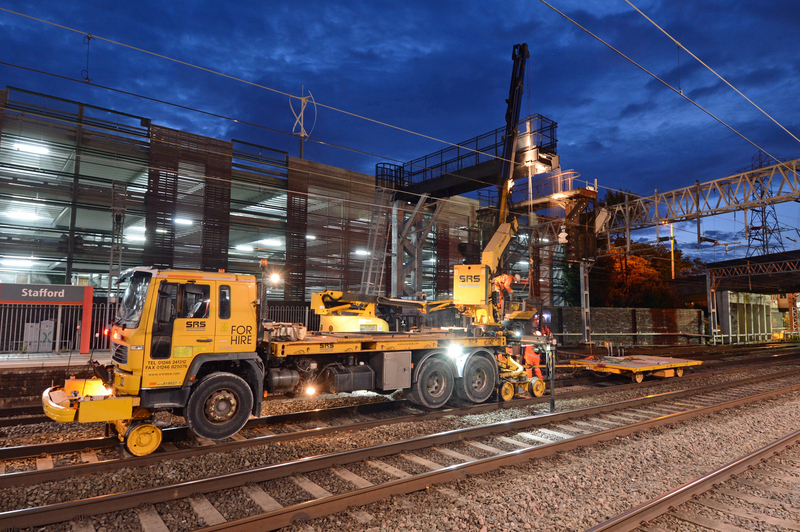 This bank holiday I’m working for Network Rail on the Stafford Area Improvement Programme (SAIP) again. Taking the pictures is only part of the job nowadays. What’s equally important and just as time consuming is getting them to the client asap, along with caption details. This can be either a description of the work being undertaken – or a bio (or even short interview) with a person being portrayed. All this is to feed the beast: Social media. Pictures are needed fast to tweet, add to Facebook or go on corporate newsboards. Now, my hotel rooms are transformed into mini editing suites where the speed of the internet is as great a consideration as the comfort of the bed or how good the shower is! I still love this job. The places I get to go to and the things I get to see still fascinate & amaze me – and I learn so much. Here’s what I was doing in the early hours of Saturday morning, whilst most of you were tucked up in bed. I’m on my way to Stafford to spend a day looking at the £250m project to increase rail capacity on the West Coast Main Line through a combination of resignalling, line speed improvements and building 6.5 miles of brand new railway around Norton Bridge. 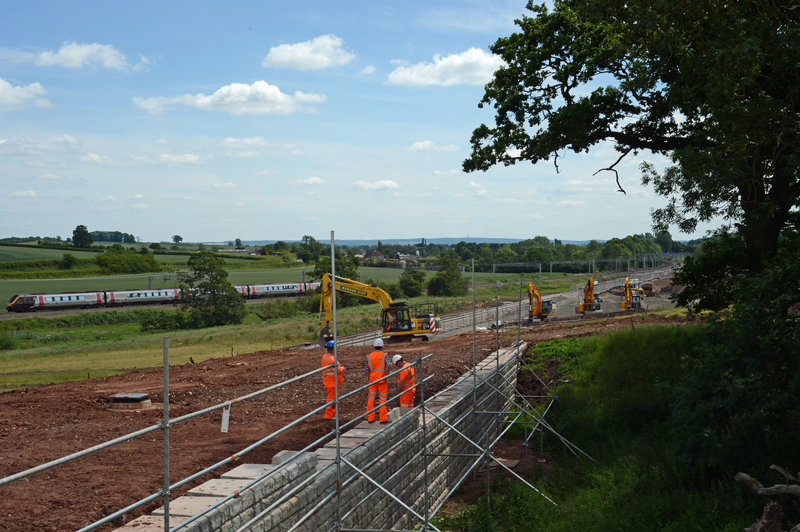 The project, known as SAIP (Staffs Area Improvement Programme) will create extra capacity for a few years & take some of the pressure off the WCML before Hs2 is commissioned. Other media colleagues were meant to be traveling up from London to join us but signal failures on the Southern WCML mean they’re unlikely to make it. 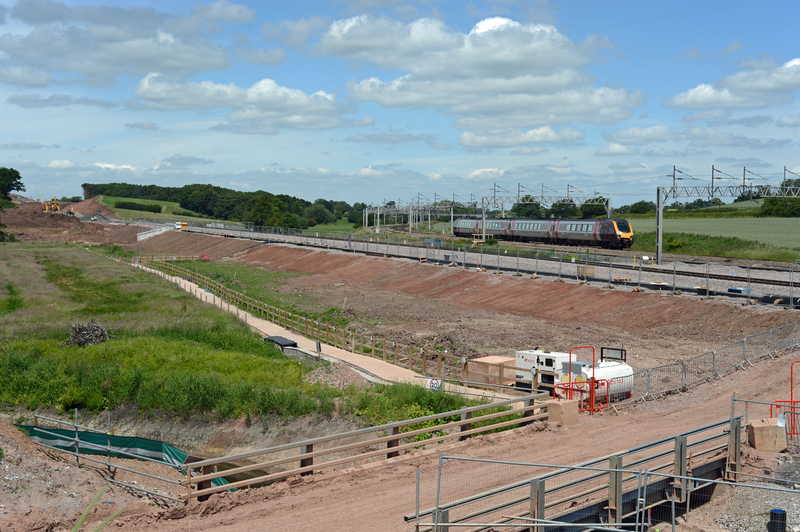 To think, we’ve only recently spent £10bn ‘modernising’ the WCML. It wasn’t enough. Too many projects were ‘descoped’ (Stafford resignalling was one) and the reliability of our rail spine is poor. Ironically, those opposed to Hs2 claim we can make do with using the WCML forever without building any new line. They think we can get away with tinkering around with the Victorian network to provide a 21st century railway. Practical experience & events like today show how out of touch with reality they were. Luckily, they weren’t allowed to prevail & we’ll be starting building Hs2 from 2017 (or 2016 if you count the enabling works). On Hs2, passengers won’t have to worry about signal failures. It won’t have any! Only one of our three London colleagues made it and services are still disrupted this evening. Apart from that, it was a good day. The Staffs Alliance team gave us a very interesting presentation, then took us for a tour of the site. I’ll blog about it in detail another time, so here’s a quick taster. This is bridge 6a on the new Down line chord from the yet to be built Searchlight Junction through to Stone. 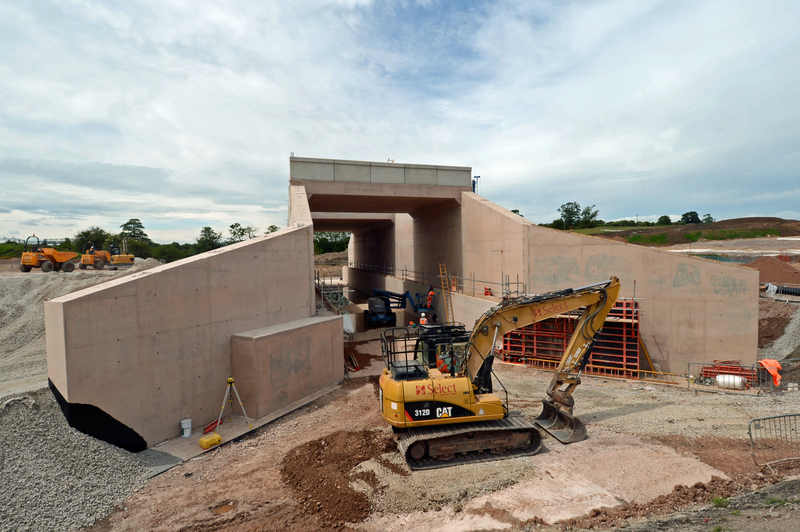 The bridge is built over the course of a stream which has been diverted until construction’s complete. Once it is, the river will run underneath. The deck above consists of two parts. The deck in the foreground will carry the double track rail line whilst the rear deck will carry the new route of the B5206. The gap between is so that fish will still swim underneath it. If there was no light well the length of dark river would dissuade them. It’s a good example of civil engineering & ecology in action. Meanwhile, to whet your appetite – here’s a few more photo’s.. The single line connection off the existing WCML, looking North. Constructing the new cutting Northwards. 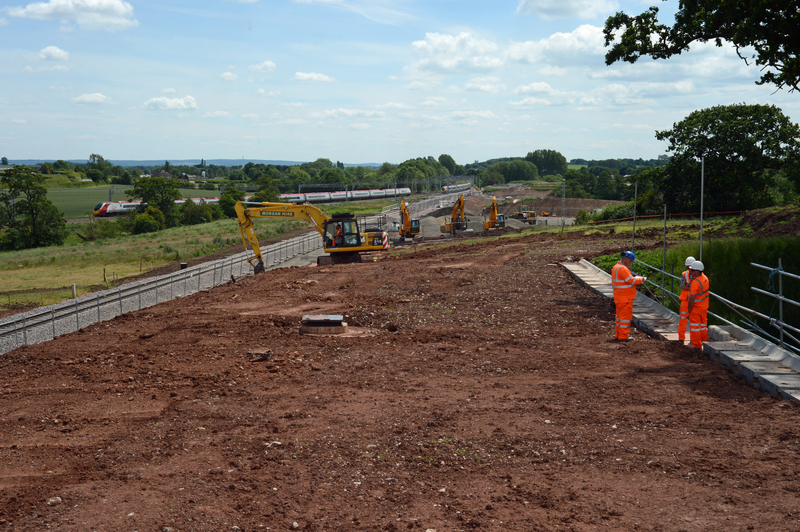 The track that’s been laid forms a railhead for works trains delivering materials to the site. Building a retaining wall to protect an old Marl pit which is being preserved. 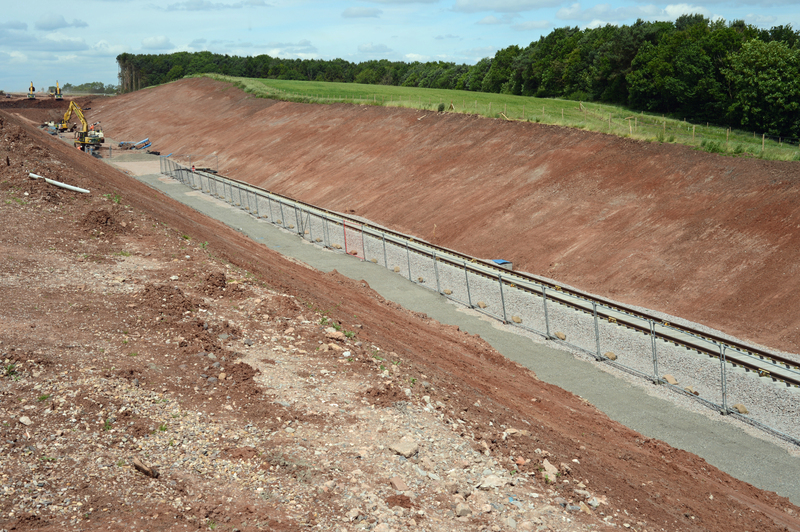 The area above at the top of the embankment is being levelled as it will contain a drainage channel.